It started with a seriously twisted chunk of poplar. Norah’s grand appearance was (tentatively) scheduled in several months, and Nicole and I were reviewing sleeping arrangements. Nicole had of course given the subject a tremendous level of consideration, and her R&D had unearthed a three sided bunk that could affix to the side of our bed. This would allow Norah to sleep safely by our side until she could graduate to her crib. The “co-sleeper” would cost several hundred dollars, so my argument was of the routine variety: A. our (my) frugality would allow me to make one for far less, and B. my lack of follow through meant that it would not happen. We would thus get to “crib” stage like nearly every other parent who does not own a co-sleeper. The plan was bulletproof. Two days later, the seriously bowed poplar plank was in the garage, waiting to be formed into a co-sleeper. Nicole had found a lumber yard and my bluff had been called. Plan B. Cut the board into pieces, screw them together onto a frame fashioned from some weathered 2×4’s, and call it a day. So I made my way to the garage and began making measurements. I knew that imperfections were baked into Plan B, but it did not take long to realize that due to the twists in the board, the ends would never come close to lining up. And appearance aside, sleeping on such a warped board would give a spineless creature a bad back. There is no way I could let my little girl spend more than a few seconds in such a place. Plan C – I would do it right. Acquire the tools needed to turn this contorted log flat and square, and provide my little gal with a safe place to rest. I did take (and enjoy) high school shop class (it was the late eighties, just long enough ago for a school to really have a wood shop) – so I had a general knowledge of the tools needed to execute this plan. Due to fond memories of shop class and time spent watching The New Yankee Workshop as a youngster, setting up a basic wood shop in my garage had actually been on my “to do” list for some time. This warped plank proved to be the catalyst needed to finally make my wood shop a reality. Did some research and soon acquired a jointer, planer and table saw. The project allowed me to rekindle some basic power tool skills from the good ol’ shop days – including rough lumber milling, edge gluing, squaring up boards, cutting dados and grooves, and so on. 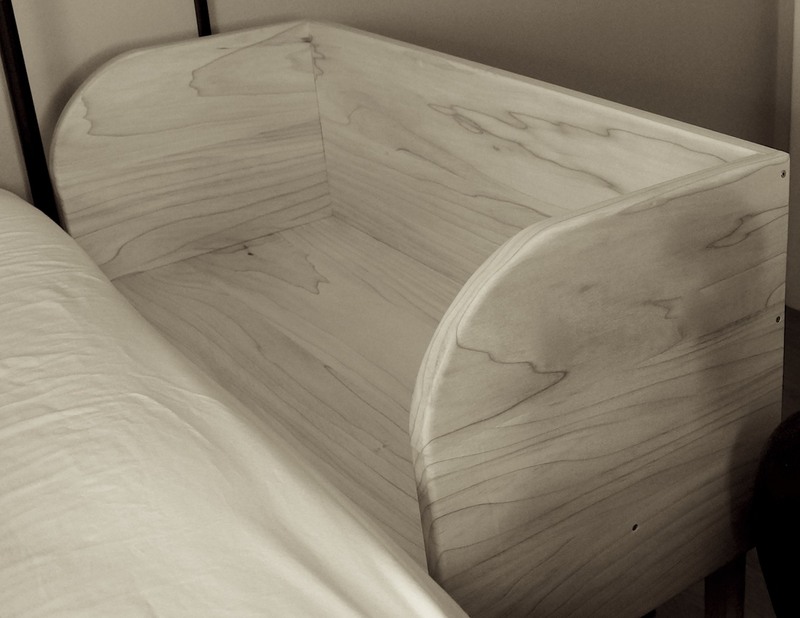 In the end, the twisted board turned into a nice co-sleeper – and an insatiable desire to make things out of wood. And so it begins….